For all the sewing that I've done, this is the only quilt I've ever made. There have been a few wall hanging quilt-like things. But this is the only blanket quilt, I think - one that has to actually DO something. 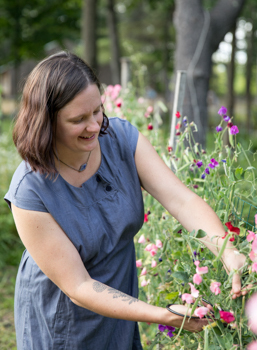 I made it in the final months of my pregnancy with Adelaide (blogged here). It's held up better than I thought it would, but in heavy rotation with many other beautiful blankets and quilts (she's a lucky girl), this one hasn't seen much washing (the binding is a little sketchy - I think lots of washing would really wear it out). Anyway, like Blair (how gorgeous is her new quilt? 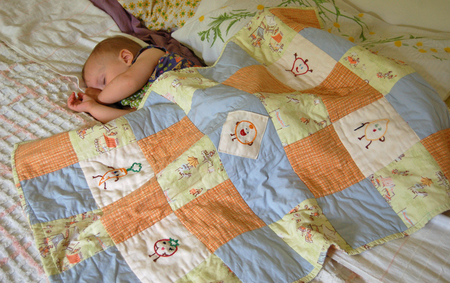 ), I've always wanted to have handmade-by-me quilts on all of the beds in the house. Currently, the boys have a Nana-made quilt (which I would love to use in rotation so as to 'save' it for them), and we have a variety of not-quite-right vintage comforters and spreads for our bed. 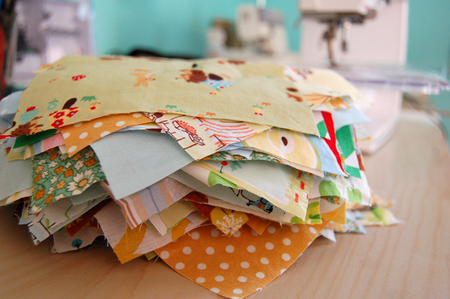 So I hereby declare this summer the Summer of the Quilt(s) - yes plural, because I'm crazy. They're all started to some degree or another (yes, really...four quilts - Ezra's is pictured above, ready to be pieced). I have such enormous respect for quilters, and I'm both in awe of and intimidated by the process. I think I get the construction okay, and I'm heavily armed with all the best books and resources I could need. It's the color thing that I get hung up on, and then the quilting part that freaks me out - getting the bulk through my machine, or handquilting the whole dang thing without messing it up too badly. But I'm motivated to plow through it - now that I've mentioned it to Ezra (he helped picked out some of his fabric. Oh my. That was interesting. ), he asks me nearly every hour if his quilt is done yet, and when, exactly, I think it might be done. Nothing like a four year old's beautiful anticipation to get over some silly adult intimidation in a hurry, huh? So. Let the Summer of Quilts begin. I'm ready.